It looks cold in there. wondering what sort of goodies are in there. My freezer needs to be cleaned out in a bad way. Yes, that rich food, health! Greetings. Mine could use some filling! I've been wanting a deep freezer for my garage so badly. We go through a lot of frozen fruit and fish. 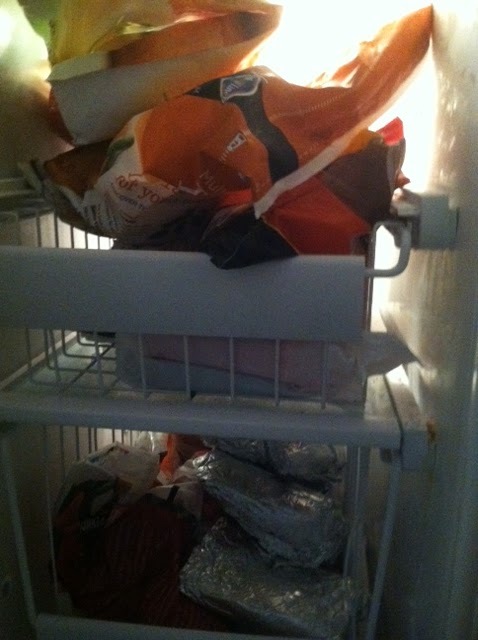 My freezer is filled with ice cream, waffles and chicken nuggets. What kinds of great things are in there? Any surprises hiding?? I think Sweetman would want to organize it. I just pulled a Reese peanut butter egg out of my freezer! I still have 3 packs squirreled away from two Easters ago. I have no idea what any of that is. The pink and blue look like clothing or folding umbrellas. Argh -- I have the same problem. Your freezer looks much more organized than mine. I always tell my girls, just shove stuff in real hard, then shut the door real fast! I'm sure it would have been a very interesting post. You're brave. I won't post what my freezer looks like. It's the kind of freezer that has to be defrosted--and let's just say I'm losing shelf space by the day! I am with Beth, me too!!! My freezer also needs to be looked about Joyce. Thanks for hosting. If you open my freezer door things fly out at you. I'm not all that organized lol. Nice wrapping of your frozen food. I always double wrap. Yup, my freezer is the same! It looks a lot cleaner than mine ...:(.